DK Arcade 2600. New 4-Level Demo! Okay, so given that I couldn't get this working on the Harmony cart with two completely different 7800 models...I just acquired a 2600jr. Can't get it working on that, either...so I'm sure there's an issue somewhere with the Harmony cart. I'm using the latest non-beta Harmony firmware, and transfering via OSX Lion...anything I should do different, or should I break down and use Winblows? Take out the card, and connect the Harmony to the computer with USB. Run the HarmonyCart.app If the bottom does not report connected with a green circle, use a different USB cable. Step 1. Select the eeloader by clicking the "... button" and double click the mounted device image called HarmonyCart, and then the arm folder which contains NTSC, PAL50 and PAL60. ........... The click the large Download EEPROM button. Unplug everything. Step 2. Mount your memory card on the computer. Select the hbios_xxx file version from the asm folder as above. Select where your memory card is mounted. Click the Copy HBIOS button. Properly eject the memory card. Japanese order only (Levels 1, 2, 3 & 4) that end after Level 4. DemoE = easy. As will be the first time though the levels. DemoH = hard. As will be the increased difficulty the next time through the levels. 1st to download the new demos! whoohoo! Just a follow up post. I played plenty rounds of it last night. DK Arcade is quite good. Firstly, the title screen is nice. You can select US and Japanese level order and even choose to play as Pauline or Mario! US game order is broken for the time being but I'm sure he'll get it working in the final version. As far as playability, the gameplay is fairly challenging. So far I haven't cleared the springboard stage to get to the final level. Gotta keep grinding away and I will beat it. As a result, I also haven't attempted playing the "hard" mode yet. 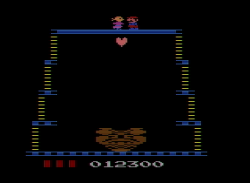 Although I wish the playfiled could have had dual colors like VCS Donkey Kong, I can understand why it was left out. The slanted girders would not be possible with dual color playfield, least not without sezure inducing flicker. Still though, if there was any way this game could incorporate dual color playfields, it would make the game almost perfect! Edited by stardust4ever, Wed Oct 15, 2014 12:38 AM. First: Sorry to any new Harmony Encore owners. This build will not run on Harmony Encore due to an outdated DPC+ ARM code file. This should be fixed quickly. Second: Thanks stardust4ever for your first impression mini-review! The level order is left out (not broken). We didn't want to put people through 6 screens to get to the cement level! 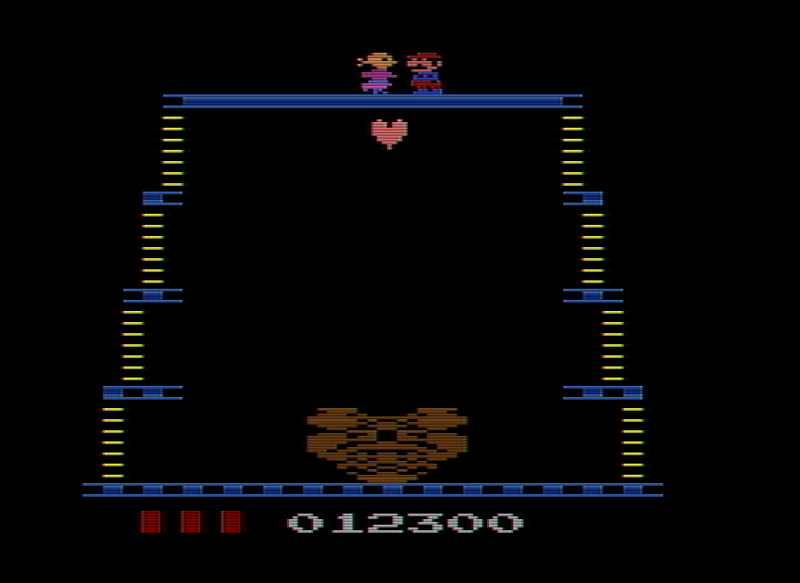 The springboard elevator jump to the lower level of the top center platform can be done if timed right! Updated binaries in first post. Found out we were using an outdated DPC+ ARM file that caused the build to fail on the newest Harmony Encore. Re-download if you plan to have these on Encore. Will this matter for older Harmony carts? Not good IMO if ROMs that worked on the older Harmonies break on Encore. Man, the springboard level was brutal. I booted it in Stella (Pauline Mode) and save-stated so many times. Maybe you could use the difficulty switches to add extra lives? I tend to die a lot. Anyway, here's the grand finale, yay! Fine by me. I was just iterating the fact taht the stage order wasn't implemented yet. I was never a fan of the US stage order. Most people likely never reached the Cement stage. And by the time all is said and done, you're pulling 150m (barrel stage every other level). However it is a little faster to get to Pauline though. Edited by stardust4ever, Thu Oct 16, 2014 12:40 AM. Looks like I need to buy a Harmony. Get one. It's totally worth it. 98% of homebrews should work fine. I'm liking this version, though I'm a bit perplexed by the demo thing. I don't think there's anything wrong with the game getting a demo, but another game with Mario got a C&D and I have mixed feelings about this being done to games based on licensed properties. It definitely is worthy of cart release, though. It's interesting how there are three different 2600 versions of DK with all four levels now (two homebrews and a hack). I like all three, though this is definitely the best of them. I like how everything is full screen in this version and how the elevator level has the best playability of the three (though to be fair, the hack doesn't have the elevators working yet). I have the original Harmony with the latest beta bios and I like it quite a bit. I love how it plays Supercharger, DPC+, and other games with extra RAM. Edited by BrianC, Fri Oct 17, 2014 7:41 PM. Buy it on day one and you have nothing to worry about! There were no issues with the Intellivision release of DK Arcade and D2K Arcade, so I'm guessing that we'll probably be ok.
Yeah, good point. I find it interesting how SSB 3DS has an assist trophy that summons a paddle and ball from one of Nintendo's pong clones. Edited by BrianC, Fri Oct 17, 2014 11:55 PM. It did not go viral on the internet with reviews from IGN either. This is such a great port. It really is hard to believe that this is possible on the humble VCS. If it ever makes it to a cart release I'm definitely in for one! Between this, PR (the game that cannot speak its name), DIN's new Pacman and his potential new M Bros game it's really great to see all these classics get the ports the VCS deserves. So if I buy a Harmony right now the currently released rom for this won't play? batari provided us the fix so we could build a rom that works on Harmony, Harmony Encore, and Stella. The demo files have been updated. I've got a question. Since you mentioned an update to the DSP+ code, are there game ROMs that exist (prefix) that will run on the original Harmony but not the Encore? If Encore doesn't maintain 100% B/C with original Harmony, that would be sad. Edited by stardust4ever, Sat Oct 18, 2014 3:57 PM. The fact is that the DPC+ batari Basic kernel had a bunch of bugs. Many refused to use it. One big fix has caused Player0 to be corrected one scanline. Anything coded before his fix and built with the latest will be one scanline off. I'll have to try some ROMs when I get my Encore. I'd rather have Harmony Encore ship, than be further delayed!!!! Encore is actually showing that the earlier ARM code had a bug. It can't be guaranteed that even the Encore will be perfectly the same as the 7800 Concerto. Both of these were to be selling a long time ago, but have gone through many necessary revisions to be the best they can be. Well I plan on getting the Concerto for 7800 and keeping my original 2600 Harmony cart. Will I run into issues? Is this still being worked on? I played the latest and think this is awesome! So many amazing homebrews! Great job! Yeah, I'm wondering the same thing???? I think Byte Knight and myself would say it is about 99% done. We added this ladder centering when climbing, but sometimes it fails and moves the player too far to one side, and when you reach the top you fall. That is a pretty big bug. We'll probably revert back to the old way. A tiny, non-showstopping bug is on the bottom conveyor belt where sometimes the fireballs have "ghost" garbage pixels. This is a bug in batari Basic when a certain number of sprites are a certain vertical distance apart. Byte Knight fixed it long ago, but I must have brought it back when I was trying to make all the hammers the same size. Other than that, I might make the opening notes just one channel. The harmony sounds okay until you blast it through a stereo system, then it sounds lousy. We talked Easter Eggs, but nothing made it in. There is 100 bytes of graphics data and a small part of one bank left for Byte Knight, but I think we are done. There are bound to be bugs, it is my first started project. But as I said, it turned out way beyond what I could have done solo. And to get both Japanese and American screen orders, and the choice to play as The Carpetner or The Lady is cool. Any news for the holiday season?